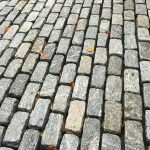 Occasionally, a customer will approach us here at REALGOODS Company with a difficult request to supply a small quantity of Granite Cobblestone that requires a custom blend of colors and sizes. Initially Mike U. contacted me to find a more durable paver to replace a man made concrete product that was failing. The pavers were spalled, breaking and generally falling apart. We suggested thin Granite Cobblestone pavers that we could provide in a 2” thickness for the walkway to the main entry to his home. After providing pictures of several colors of cobblestone by email, Mike decided to order samples of the Yellow granite cobbles, and Pink granite cobbles for evaluation of in hand samples. He showed the stones to his stone mason to get his opinion of the cobblestones, and the mason said these stones would be his most durable and attractive choice for the project. A year passed, and Mike and I then reconnected in February of 2018, ready to move forward with the project. REALGOODS Company arranged for a custom split size of Granite Cobblestone paver in 4x4x2, 4x8x2 for his specific application. It was a lot of extra work for a small project, but worth the effort after seeing the results. Our philosophy at REALGOODS Company is that any project worth undertaking, regardless of size, will become a conversation with others who see the beauty and experience the durability of our granite cobblestone pavers. If you have a small project, don’t hesitate to call 888-433-4443, and we will be happy to work with you. 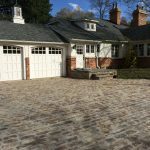 You may be so pleased with our products and services that you decide to eventually proceed with a more expansive granite cobblestone driveway, walkway, wall or other creative application. Looking forward to hearing from you to provice the opportunity for similar outstanding results.